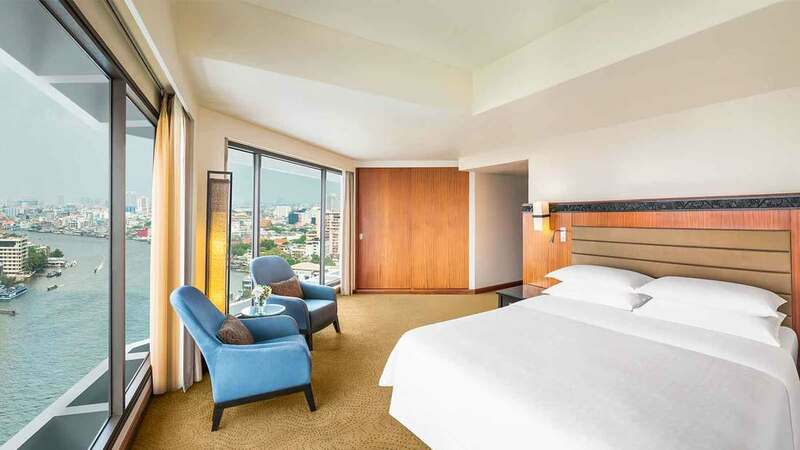 5-Star Royal Orchid Sheraton specifies I Series telephones. The Foodie phone for hospitality! New and interesting F&B offerings can be a great way to attract unique travelers to your hotel. But what if you don't have an option for F&B services within your property? 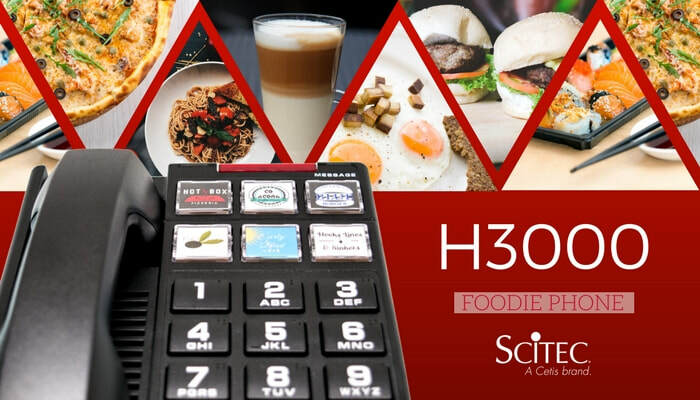 The H3000 Big Button phone by Scitec connects your guests to the best eateries in town...all from the comfort of their own guest room. The lack of convenient hotel food options can play a huge role in the decision-making process of today’s traveler. With the popularity of shows like Diners, Drive-ins, Dives(Food Network) and Anthony Bourdain – No Reservations (Travel Channel), it's increasingly common to find travelers that consider themselves Foodies. If you don't know already, a Foodie is someone who has a specific interest in food culture. Foodies seek out cuisine options that are popular with the locals wherever they go, and they often travel far and wide to find these options. With 6 easily customizable speed dials you can offer your guests one-touch access to quality local restaurants, from setting reservations to ordering delivery. You can even lease speed dial keys out to surrounding restaurants or taxi services, cultivating new local relationships, increasing revenue, and improving guest satisfaction. Click here for product details, here to view the video, or here to request a quotation. Visit with Cetis at upcoming FHA 2018 show in Singapore. Visit with the Cetis team at FHA 2018 in Singapore, April 24-27. Be sure to visit with the Cetis team at FHA 2018 to be held this month at the Singapore Expo & Suntec pavilion, April 24-27. 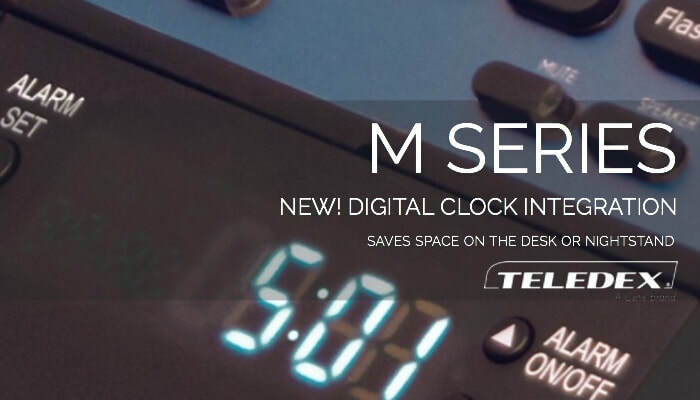 Be sure to ask about the new Teledex M Series Clock telephone, available in single and two-line analog configurations with 0, 5 or 10 configurable guest service keys. Click here to arrange at meeting with the team during the show. Cetis Middle East to exhibit in April at Wyndham EMEA conferences. Cetis Middle East demonstrates new Cetis products at the Wyndham EMEA. 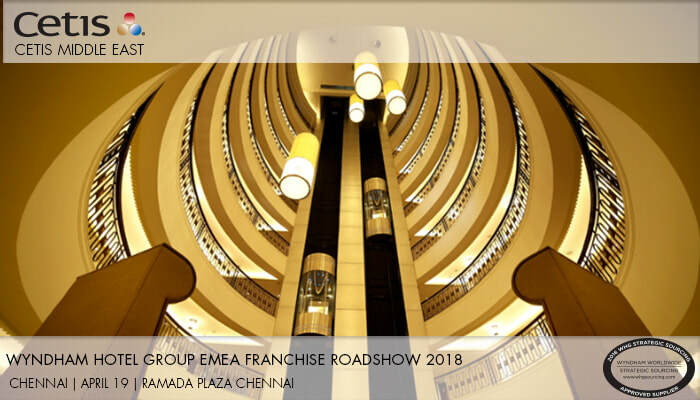 The Cetis Middle East team will be exhibiting telephone and USB charging solutions at the upcoming 2018 Wyndham Hotel Group EMEA Franchise Roadshow being held at the Ramada Plaza Chennai on Thursday, April 19. The one-day roadshow will include plenary sessions, workshops and a celebratory networking dinner. Show attendees will include General Managers, and Directors of Sales & Marketing from the designated region, the Wyndham Hotel Group corporate team, and our sponsoring Wyndham suppliers. 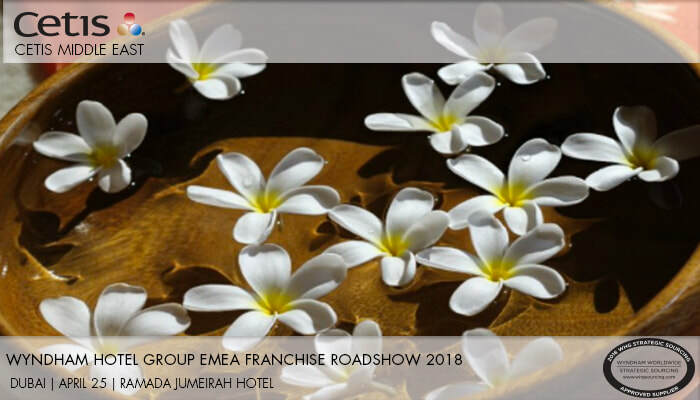 Click here to arrange at meeting with the team at the Chennai or Dubai roadshows. Cetis exhibits at Hilton Owner-Supplier Workshop. Cetis team meets with customers, partners, and friends during Hilton March workshop. 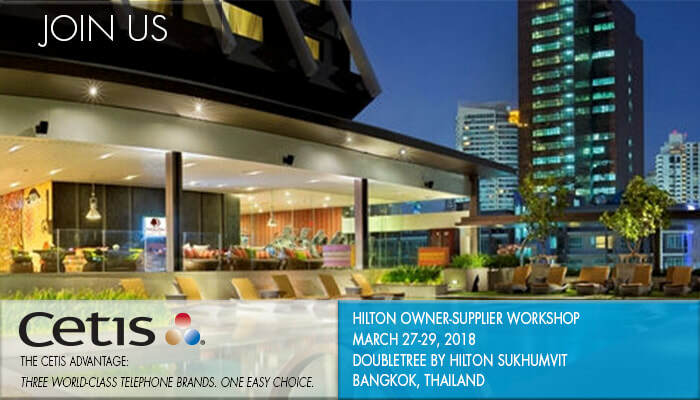 During March, the Cetis team met with customers, partners, and friends at the Hilton Owner-Supplier Workshop held March 27-29, 2018 at the DoubleTree by Hilton Sukhumvit, Bangkok, Thailand. The workshop was specially designed for invited suppliers to present their products and/or services to the owning company representatives of Thailand pre-opening hotels, and operating hotels that will be undergoing renovation. ​Click here to arrange a meeting with the Cetis team for your next renovation or new construction project. Panasonic and Cetis debut new products at AAHOA 2018. Latest Panasonic and Cetis hospitality telephony product and feature innovations displayed at AAHOA 2018. 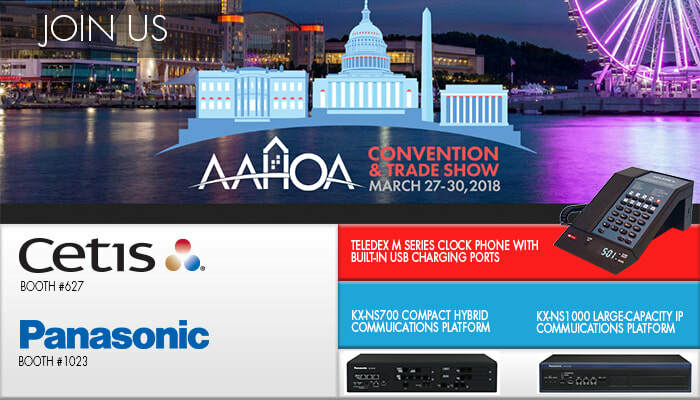 Cetis and Panasonic recently exhibited at the 2018 AAHOA Convention & Trade Show, March 27-30 at the Gaylord Resort & Convention Center, in National Harbor, Maryland. In Cetis Booth #627, visitors were invited to see a demonstration of the new Teledex M Series Clock phone. In Booth #1023 for Panasonic demonstrated the KX-NS700 Compact Hybrid and KX-NS1000 Large-Capacity IP Communications Platforms. Click here to view the new Panasonic Solutions For Hospitality brochure. ​Click here contact the Cetis or Panasonic teams for your next renovation or new construction project. Now choose optional Clock and/or Bluetooth integration on analog corded models. 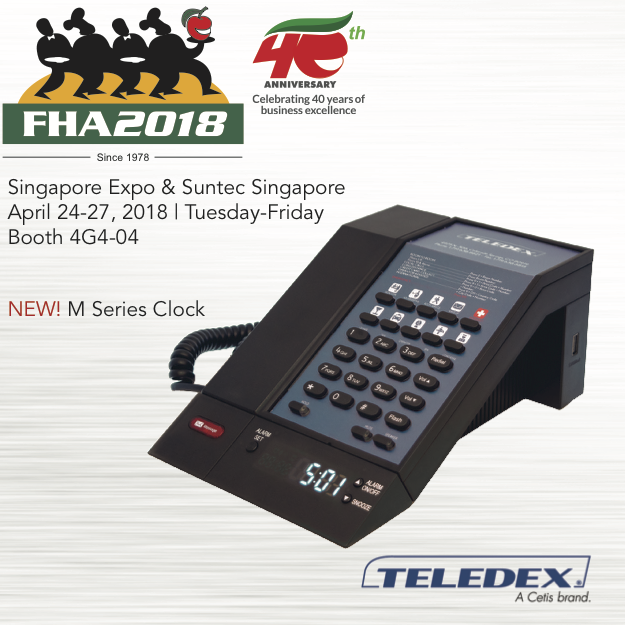 More than just a telephone, Teledex M Series hotel phones are available in analog, VoIP, corded and cordless configurations with USB charging ports on both the phone and RediDock remote handset kit that support guest smart device charging. ​Now choose optional Clock and/or Bluetooth integration on analog corded models. Corded and cordless base models available with 0, 5 or 10 configurable guest service keys, and 0, 3, or 6 guest service keys on RediDock remote handset kits. Click here for product details, here to view the video, or here to request a quotation. Social media hospitality best practices. How can leading brands stay ahead of the competition? By listening to customers within hospitality and adjacent spaces that impact the industry. The hospitality sector continues to be one of the world’s fastest expanding industries – with global estimates reaching $1.6 trillion in 2018. The market is being driven both by more disposable income from emerging economies and also rising desire to travel more broadly in the developed world. The number of international travelers has doubled over the last 20 years with growth not only in developing countries, but also in established markets like the U.S. which is on pace for another record breaking year in 2018. Further, strong economies also mean a healthy demand for business travel so the sector is seeing increased revenue from multiple areas. The opportunity for hospitality companies is clear – the challenges lie in changing consumer behaviors and stiff competition for traveler interest. 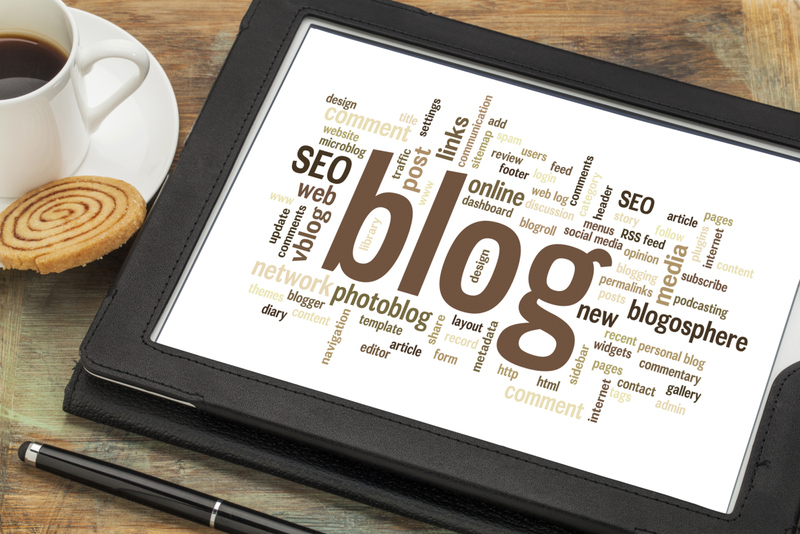 So, how can leading brands stay ahead of the competition? The answer is by listening to customers – both within hospitality and also in adjacent spaces that impact the industry (e.g. healthy living, family needs, etc.). 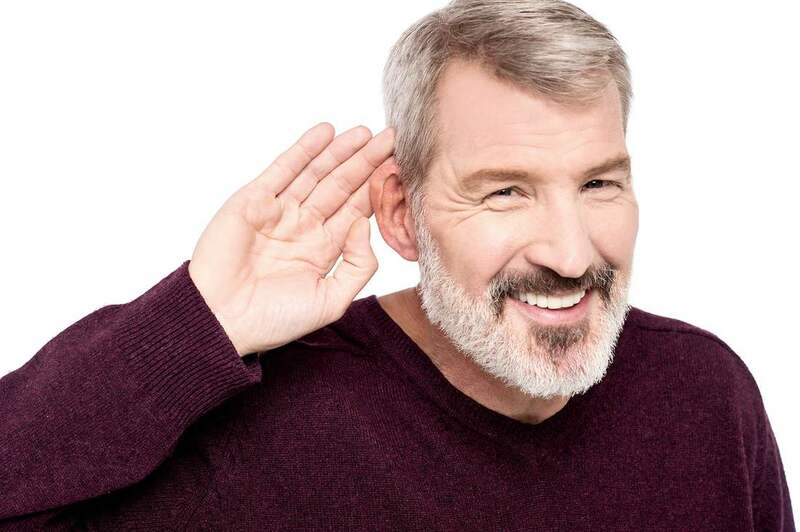 Social listening is uniquely suited to inform an overall traveler strategy and the individual personalization needed to help hospitality companies differentiate from the competition. Specifically, social listening complements other research with unfiltered consumer opinions, immediate feedback on traveler experiences (both your own and competitors), and insight into broader category trends.